I’ve been reading the fantastic User Onboarding website a lot lately, and it’s really got me thinking about the initial experience that PrayerMate users have. Anecdotal evidence suggests that people find it quite hard to get over that initial hump of adding all of their prayer points, and until you do, there’s very little to ever bring you back to the app. The result is that the number of active users has never grown nearly as quickly as the number of downloads. There’s still plenty of room for improvement in the future here, but hopefully this’ll just take the edge off the first run experience and help people grasp the basic concepts of the app a little quicker. Prayer is one aspect of the Christian life that very often leaves us feeling guilty. We know we don’t pray often enough, and we probably like like we don’t pray widely enough either. Three years ago I set out to see what I could do to help in this important area. As a software developer, it’s perhaps not surprising that my thoughts turned to ways in which the new crop of mobile devices such as the iPhone & tablet devices could be employed to improve our prayer life. Hence the PrayerMate app was born. By God’s grace it’s come a long way since then, with a host of new features, being downloaded over 17,000 times, being named runner up in the Christian New Media Awards 2013, a successful Kickstarter campaign to fund development of the Android version, and now being sponsored by the Diocese of London as part of their “Pray for Seven” initiative, allowing the app to be offered free of charge to users. Most importantly, it seems to have really been a blessing to many in their desire to pray more – for which I give thanks to God! Today I am thrilled to announce the next step forward in PrayerMate’s mission to help people pray. Firstly, there’s a HUGE update to the Android version of the app, adding a whole range of features that were previously only available to iOS users. 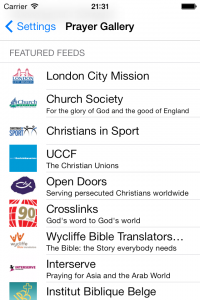 In particular, you can now subscribe to regular prayer updates from over 60 mission organisations and charities, including the likes of Open Doors UK and Australia, UCCF The Christian Unions, London City Mission, the Mothers’ Union, Pioneers, NZCMS, Crosslinks, FIEC, Church Society, Wycliffe Bible Translators UK and USA and many many more. The full list is available here. If you represent a church or charity and would like to see your prayer points added to PrayerMate, I’ve added a little guide here. Other new features include the ability to archive prayer points you no longer want to pray for and better support for tablet devices. You can also attach any PDF prayer letters that you receive in your email inbox to your subjects, giving you that little extra help to know how to pray for people. 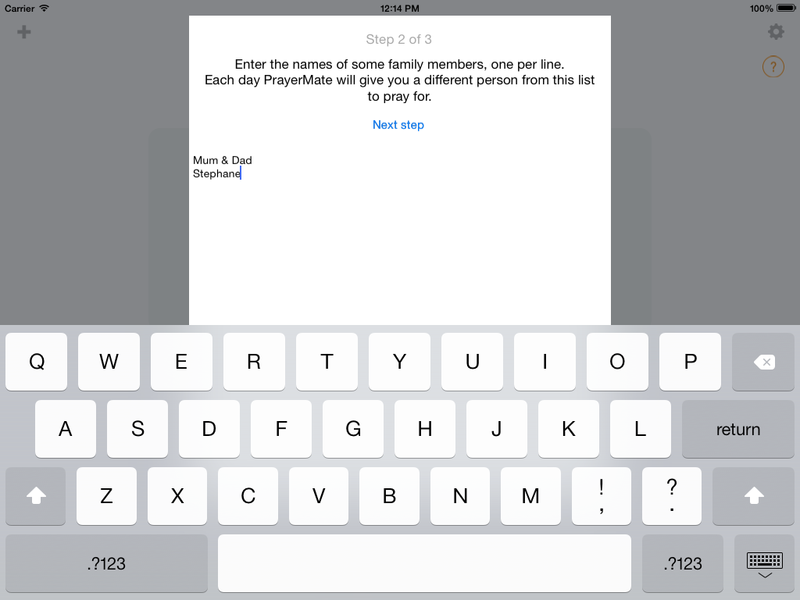 Just “Share” your document with PrayerMate, and it’ll let you choose or create a subject to attach it to. 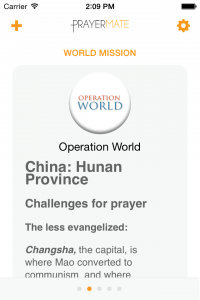 But that wasn’t nearly enough – not wanting iOS users to feel left out, I’ve also got one brand new prayer feed on both platforms that I am bursting with excitement about: you can now get the Operation World country for the day through PrayerMate – completely free of charge! If you’ve not come across it, Operation World is a truly fantastic resource brimming with information on every country in the world and how to pray for it. The country of the day feed is a great way to help you pray for our world, which is something I’m sure we all want to be doing. In time I hope to add individual countries to the prayer gallery too, so that if you have a heart for a particular country you can access prayer points on that too, but that may take a little longer. Truth be told, I won’t be totally happy until I’ve persuaded Banner of Truth to let me get some prayers from the Valley of Vision into PrayerMate, but one step at a time, right?! Of course, you could always sign the petition to lend a helping hand to my cause. 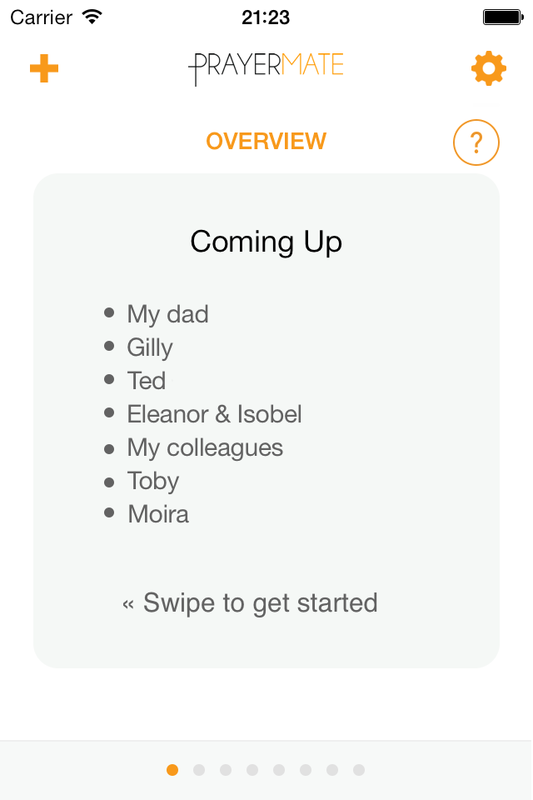 Oh, and one more thing… I’ve also quietly been working on adding syncing to the iOS version of the app, for those of you with multiple devices. It’s not quite ready for general release yet, but if you’d like to be a beta tester then get in touch and I’ll let you get a sneak preview. I hope you enjoy these new features. Do tell all your friends to download the app (remember, it’s totally free thanks to the generous sponsorship of the Diocese of London!) and feel free to hit the “Send feedback” button inside the app any time you like if you have problems, questions or suggestions for how to make the app even better. If you’ve not joined the mailing list yet then that’s a great way to keep up to date with the latest news and tips – I tend to post no more than once a month. Today I am pleased to announce a new PrayerMate sponsor, the Diocese of London. As part of their “Capital Vision 2020″ programme, the Diocese is encouraging people to commit to praying regularly for seven people, for an opportunity to share the story of our faith. 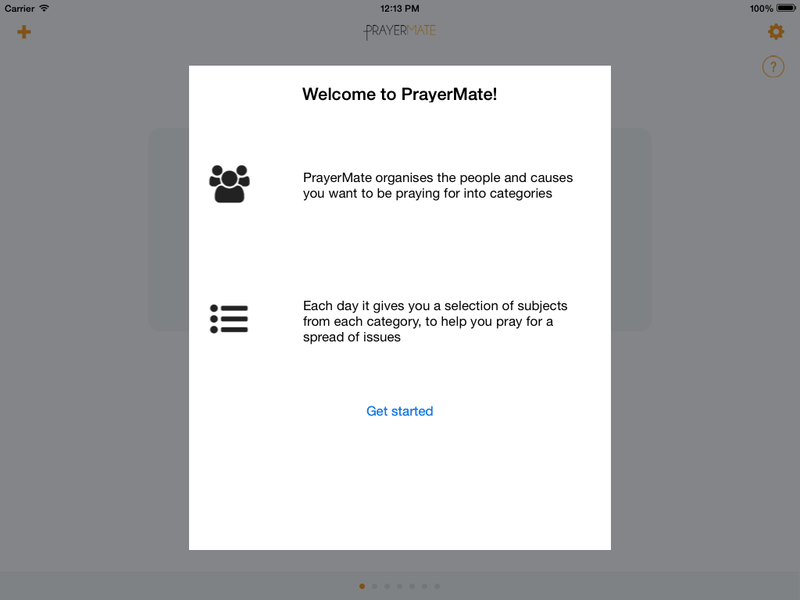 PrayerMate seemed like such a good fit as something that could help people in this that it seemed like a great opportunity. Thanks to the Diocese’s sponsorship, PrayerMate will continue to be available free of charge until the end of June 2014.